Partly cloudy skies. Low 43F. Winds NNW at 10 to 20 mph.. Partly cloudy skies. Low 43F. Winds NNW at 10 to 20 mph. Aubrey Trail looks on as his attorneys, Joe and Ben Murray, confer during a hearing before Judge Linda Bauer in Saline County Court in June. WILBER — The June trial of Aubrey Trail remains on track even after prosecutors filed a new charge alleging he conspired to commit first-degree murder in the November 2017 slaying of Sydney Loofe. “I am not guilty,” Trail told Saline County District Judge Vicki Johnson at his arraignment on the new count Wednesday. 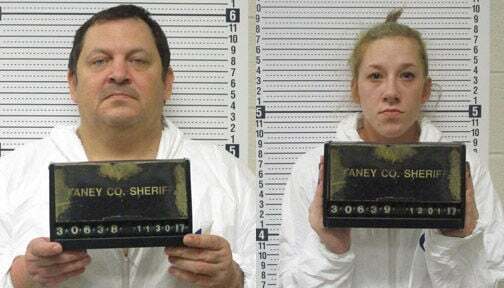 Prosecutors had previously charged Trail and Bailey Boswell with first-degree murder and improper disposal of human remains in Loofe’s death. They added the conspiracy charge only in Trail’s case earlier this month. In the alleged conspiracy, prosecutors say Trail and Boswell solicited young women online, recruited others to carry out a murder and selected Loofe as their victim. Loofe, 24, met Boswell on the dating app Tinder and went missing Nov. 16 after going on a date with Boswell the night before. Next month, Johnson will preside over a hearing over evidence the state wants to present at trial rebutting Trail’s claims that Loofe's death was a mistake. Prosecutors may also notify the court of their evidence of motive in Loofe’s killing, a prosecutorial theory kept under wraps in the high-profile murder case. At that hearing, Trail’s attorneys will seek to find out which of his past crimes state prosecutors may seek to bring up at the June trial. Joe Murray, one of Trail’s court-appointed attorneys, said the defense will also ask for an estimated 18 to 20 hours of audio tapes of Trail’s phone calls from jail, so attorneys can determine which ones they may need to fight from being admitted at trial. Preparing for trial has included traveling as far as Mississippi to depose witnesses, which number more than 500, Murray said. The state is seeking the death penalty for Trail and Boswell. The new conspiracy charge carries a maximum penalty of 50 years in prison. Wednesday, the 52-year-old Trail was handcuffed and seated in a wheelchair during his arraignment. Murray said his client has been having blood pressure problems lately. He is detained at the Diagnostic and Evaluation Center in Lincoln. Boswell remains at the Saline County jail. Her case has not yet been set for trial.